I’ve been a fan of the RailsEnvy guys (Gregg Pollack and Jason Seifer) ever since their “Hi, I’m Ruby on Rails” spoof of the “I’m a Mac” ads, and have been listening to their podcast ever since. 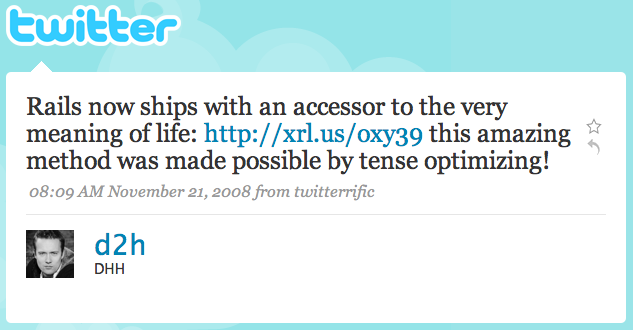 I even got a mention on it once. Well that’s not strictly true – I wasn’t actually mentioned, but a patch I’d contributed to Capistrano was, which is close enough. Recently, Gregg and Jason have branched out into screencasts, but I hadn’t actually watched one because (understandably) they charge for them, and I was too tight to cough up the cash. £1200 for a new MacBook, no problem. A fiver for a screencast? What am I, made of money? Anyhow, when I saw that they were looking for people to review their Ruby on Rails Envycast, covering the latest goodness in Rails 2.2, I jumped at the chance to get a free copy. A wonderful example of cognitive bias, given that I wouldn’t have agreed to write a review just to be paid $16. The basic $9 gets you the screencast and a set of code samples to go with it, or for $16 they’ll throw in Carlos Brando’s Ruby on Rails 2.2 PDF too. Alternatively the PDF is available on its own, also for $9. The video is available in Quicktime or Ogg formats at a resolution of 569×480, as well as a version optimised for iPhones and iPods. Total running time is just under 45 minutes, and incredibly the first 39½ of those go by before Jason makes any claims about Rails’s scalability. I don’t know whether it’s unique, but the Envycast style of having the presenters chroma-keyed onto the Keynote presentation generally works very well. The visuals themselves are professional, although sometimes the ‘sparkle’ effect is a bit overused for my taste. The presentation style is much as you’d expect if you’ve listened to the podcasts, with plenty of cheesy humour to keep things interesting. I think having two people present in a conversational style is a big help. The screencast is split into sections, each covering the new features for a different component (ActiveRecord, ActiveSupport, ActionPack, ActionController, Railties, internationalization and performance). The Quicktime version (not sure about the others) has bookmarks, making it easy to jump to a particular section. The whole thing is set against a variety of city skylines to liven the background up a little – by the way guys, that’s Tower Bridge, not London Bridge. Each new feature is introduced with an example, generally contrasting the ‘old’ way of doing something with the equivalent in 2.2. There’s enough detail to get the idea of what’s changed, without dwelling too long on each one. One tiny gripe with the code snippets on screen: the pedant in me hates seeing curly quotes in code, because I know if I typed puts ‘foo’ into irb instead of puts &apos;foo&apos;, it wouldn’t work. The screencast comes with a set of code samples to illustrate all the features discussed in the screencast. These take the form of sample classes with Test::Unit test cases, along with rakefiles to run them. The sample directory contains a frozen installation of Rails 2.2, so all you need to do to run them is add the appropriate values to database.yml. I had trouble running them initially because they were inside a directory with a space in its name, but other than that it all worked nicely. The PDF that comes with the $16 bundle is by Carlos Brando, well-known for his free Rails 2.1 book. It’s available in the original Portugese, or translated to English by Carl Youngblood. The book weighs in at 118 pages, and as you would expect goes into more detail than the screencast. 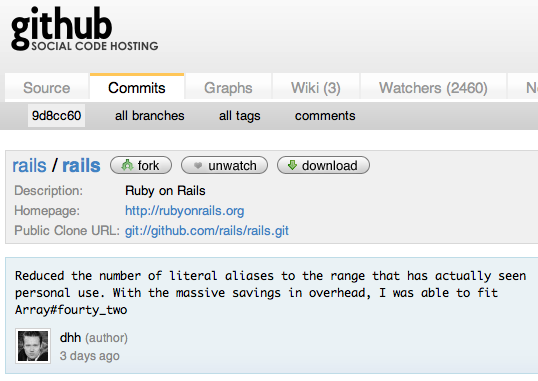 It claims to cover all the major changes in Rails 2.2 (I haven’t checked! ), and contains clear descriptions with examples. So is it worth it? On balance, I think the answer is yes, although I wonder whether they’d sell more at $5 rather than $9 – after all, I can buy (to pick an example at random) the entire Naked Gun trilogy on DVD for roughly the same amount, and Gregg and Jason aren’t that funny. The value is in collecting all the information in one place – you could trawl through the release notes and lighthouse tickets to get all the same information, but if you value your time at all, the screencast and PDF pay for themselves many times over. Should you buy the PDF, the video or both? If you just want the hard facts, go for the PDF, but if you want to be entertained too (assuming you find the Rails Envy podcasts entertaining), get the video as well. The next episode, Scaling Ruby, is out now, and I might buy it just to see if Jason finally admits that Rails might actually be able to scale.